(Nanowerk News) In a single day, a solitary grad student at a lab bench can produce more simple logic circuits than the world's entire output of silicon chips in a month. So says a Duke University engineer, who believes that the next generation of these logic circuits at the heart of computers will be produced inexpensively in almost limitless quantities. The secret is that instead of silicon chips serving as the platform for electric circuits, computer engineers will take advantage of the unique properties of DNA, that double-helix carrier of all life's information. In his latest set of experiments, Chris Dwyer, assistant professor of electrical and computer engineering at Duke's Pratt School of Engineering, demonstrated that by simply mixing customized snippets of DNA and other molecules, he could create literally billions of identical, tiny, waffle-looking structures. Dwyer has shown that these nanostructures will efficiently self-assemble, and when different light-sensitive molecules are added to the mixture, the waffles exhibit unique and "programmable" properties that can be readily tapped. Using light to excite these molecules, known as chromophores, he can create simple logic gates, or switches. These nanostructures can then be used as the building blocks for a variety of applications, ranging from the biomedical to the computational. This is a closeup of a waffle. "When light is shined on the chromophores, they absorb it, exciting the electrons," Dwyer said. "The energy released passes to a different type of chromophore nearby that absorbs the energy and then emits light of a different wavelength. That difference means this output light can be easily differentiated from the input light, using a detector." Instead of conventional circuits using electrical current to rapidly switch between zeros or ones, or to yes and no, light can be used to stimulate similar responses from the DNA-based switches – and much faster. "This is the first demonstration of such an active and rapid processing and sensing capacity at the molecular level," Dwyer said. The results of his experiments were published online in the journal Small. "Conventional technology has reached its physical limits. The ability to cheaply produce virtually unlimited supplies of these tiny circuits seems to me to be the next logical step." DNA is a well-understood molecule made up of pairs of complimentary nucleotide bases that have an affinity for each other. Customized snippets of DNA can cheaply be synthesized by putting the pairs in any order. In their experiments, the researchers took advantage of DNA's natural ability to latch onto corresponding and specific areas of other DNA snippets. Dwyer used a jigsaw puzzle analogy to describe the process of what happens when all the waffle ingredients are mixed together in a container. "It's like taking pieces of a puzzle, throwing them in a box and as you shake the box, the pieces gradually find their neighbors to form the puzzle," he said. "What we did was to take billions of these puzzle pieces, throwing them together, to form billions of copies of the same puzzle." 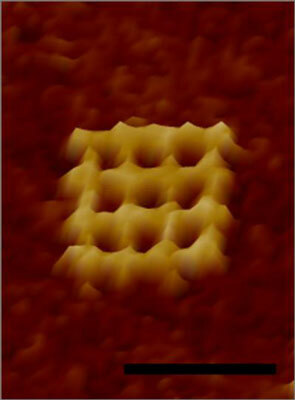 In the current experiments, the waffle puzzle had 16 pieces, with the chromophores located atop the waffle's ridges. More complex circuits can be created by building structures composed of many of these small components, or by building larger waffles. The possibilities are limitless, Dwyer said. In addition to their use in computing, Dwyer said that since these nanostructures are basically sensors, many biomedical applications are possible. Tiny nanostructures could be built that could respond to different proteins that are markers for disease in a single drop of blood.